This isn't any ordinary grilled cheese sandwich. 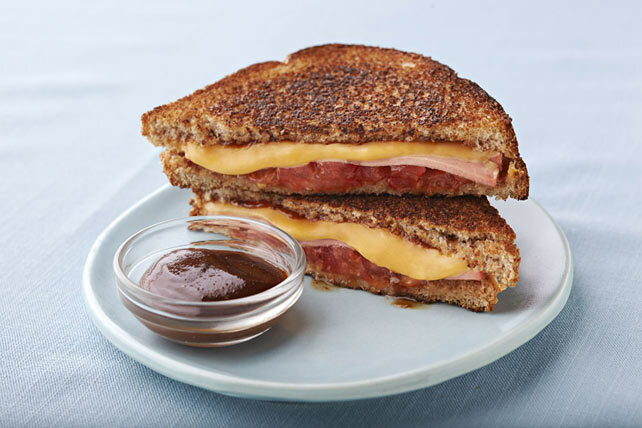 Shake up your lunch routine with our BBQ Grilled Cheese & Bologna sandwich - it's layered with barbecue sauce, cheese slices, bologna and tomatoes. Spread one side of each slice of bread, with 1 tsp. barbecue sauce. Top 1 bread slice with 1 Kraft Single. Layer with bologna, tomato and remaining Kraft Single. Top with remaining bread slice. Spray frypan with non-stick cooking spray. Add sandwich; cook on medium heat for 2 min. on each side or until golden brown.